The pipeline has made Bar Mitzvah ! The pipeline which carries gas from Egypt to Israel and Jordan was blown up on Monday, for the 13th time in the past year. According to a BBC report, the blasts happened near the town of el-Arish in the north of the Sinai desert, sending flames high into the air, witnesses said. The Egyptian gas pipeline provides 43 percent of Israel’s natural gas. 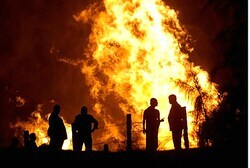 The explosion could lead to disruptions in the supply of gas, as has happened following similar explosions in the past. Also at I.S.U. regarding the pipeline — “Oh no…… Not again !” — Covering the previous ‘events’. This entry was posted on Monday, March 5th, 2012 at 17:32 and is filed under Main Postings. You can follow any responses to this entry through the RSS 2.0 feed. You can leave a response, or trackback from your own site.